Tacoma Mountaineers Branch Orientation Open House and Saving the Grand Canyon of the Upper Amazon: 24 Days on the World's Most Endangered River by Jayson Owens on May 16th. 7pm – Come see our great orientation show of the programs and courses offered by the Tacoma Mountaineers. We welcome new members, prospects and friends. Bring the family to see what we do including climbing and scrambling, sea kayaking, skiing, snowshoeing, hiking, social & family activities, first aid, sailing, navigation, avalanche training, and more. This will be a chance to visit with committee people in activities of interest to you. 7:45 pm – Saving the Grand Canyon of the Upper Amazon: 24 Days on the World's Most Endangered River. 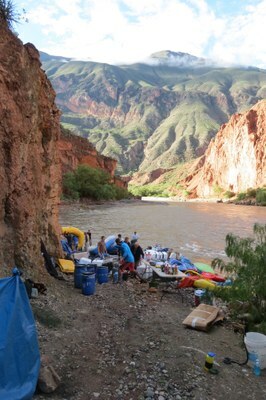 In February 2014, a group of 22 river enthusiasts and activists completed, quite literally, the trip of a lifetime. Join the Tacoma Mountaineers on a quest to save the “last great river,” as Jayson Owens recounts the trials and tribulations of a 24 day river expedition down Peru’s Rio Marañón including run-ins with wily customs agents, picture deleting security guards, negligent bus drivers, angry natives and 23 counts of pollo a la brasa! The slideshow will end with a call to action to help Save the Grand Canyon of the Upper Amazon. Jayson has been river guiding since 2000 and is the proprietor of Evergreen Adventure Guides, but you may recognize him from his more public role as the resourceful Operations Manager at Edgeworks Climbing.